Hi. I'm back to work on Tuesdays and Wednesdays from now until April 15th. So I am sure at some point I will get behind......but will do my best to keep up. 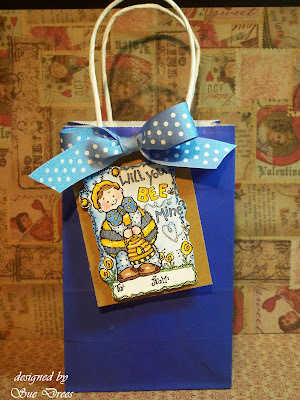 For today, I made a tag for a gift bag for the Challenge at Penny Black. I just ordered some new (old) Penny Blacks and can't wait to show them to you. So darn cute. The Challenge this week was to use Blue and Gold. I have colored this image with Copics and cut it out and mounted it on a gold sparkly tag. I've added some stickles to the little bees wings. I added a big bow to the top of the tag for interest. I sponged the background on the stamped image in blue. I thought this looked like a vintage PB...such a signature look and really, really cute! This is gorgeous Sue! Everything just pops out at you, the way it should, love it! Too too cute! What a wonderful tag to make. Hope you don't get worked too hard - i go back Thursday 28th Jan - sooo NOT looking forward to it! This is a great vintage PB stamp! 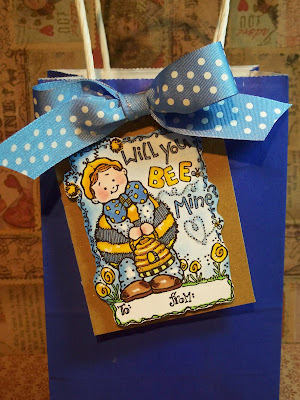 Great idea to make a gift tag and love how you coloured it! Don't work too hard! after this i hope i can use my leg again and learn to go like before. What a gorgeous tag! 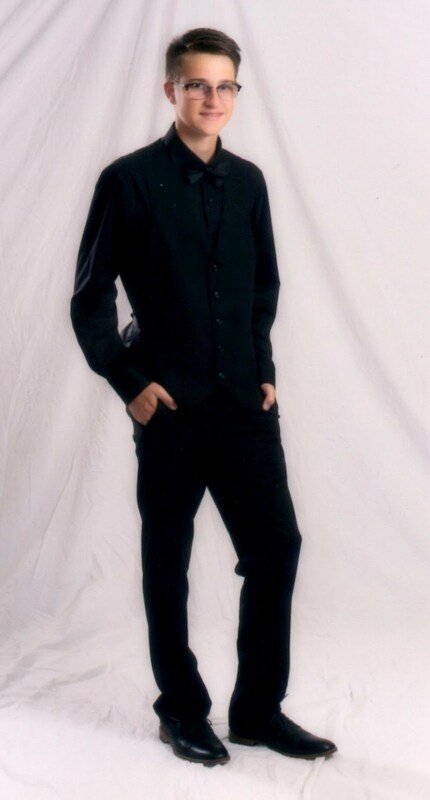 I've not seen this images before - he's fab!!! That's a really sweet image! Love your new header photo too. Wonderful sweet card, adorable image. I love the older cute PB stamps. how you've colored it. Very pretty. I also like the background paper. Think I wouldn't notice? Sue, this is adorable! love it! I've seen this stamp on ebay...gonna have to watch for it again! tfs!